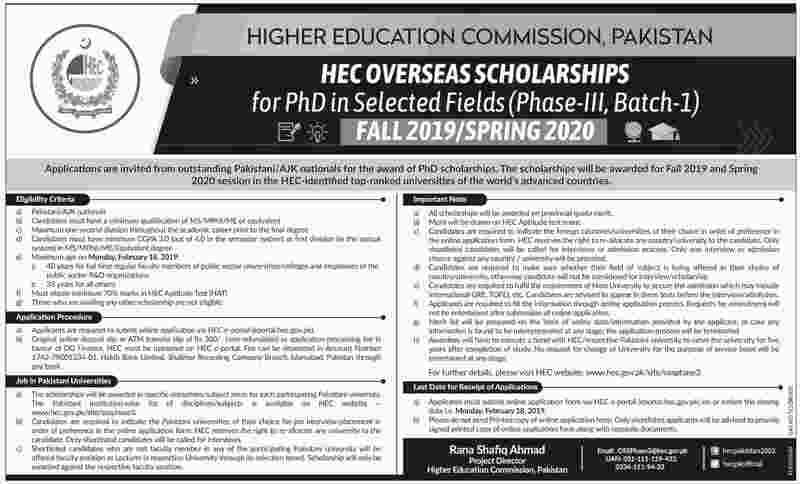 Applications are invited from outstanding Pakistani/AJK nationals for the award of PhD scholarships. The scholarships will be awarded for Fall 2019 and Spring 2020 session in the HEC-identified top-ranked universities of the world's advanced countries. Applicants are required to submit online application via HEC e-portal (hec.gov.pk). Original online deposit slip or ATM transfer slip of Rs 300/- (non-refundable) as application processing fee in favor of DG Finance, HEC must be uploaded on HEC e-portal. Fee can be deposited in Account Number 1742-79001334-01, Habib Bank Limited, Shalimar Recording Company Branch, Islamabad Pakistan through any bank. The scholarships will be awarded in specific disciplines/subject areas for each participating Pakistani university. Candidates are required to indicate the Pakistani universities of their choice for job interview/placement in order of preference in the online application form. HEC reserves the right to re-allocate any university to the candidate. Only shortlisted candidates will be called for interviews. Shortlisted candidates who are not faculty member in any of the participating Pakistani university will be offered faculty position as Lecturer in respective University through its selection board. Scholarship will only be awarded against the respective faculty position. All scholarships will be awarded on provincial quota merit. Merit will be drawn on HEC Aptitude test score. Candidates are required to indicate the foreign countries/universities of their choice in order of preference in the online application form. HEC reserves the right to re-allocate any country/university to the candidate. Only shortlisted candidates will be called for interviews or admission process. Only one interview or admission chance against any country / university will be provided. Candidates are required to fulfill the requirement of Host University to secure the admission which may include International GRE, TOFEL etc. Candidates are advised to appear in these tests before the interview/admission. Merit list will be prepared on the basis of online data/information provided by the applicant. In case any information is found to be misrepresented at any stage; the application process will be terminated. Awardees will have to execute a bond with HEC/respective Pakistani university to serve the university for five years after completion of study. No request for change of University for the purpose of service bond will be entertained at any stage. Applicants must submit online application form via HEC e-portal (eportal.hec.gov.pk) on or before the closing date i.e. Monday, February 18, 2019. Please do not send Printed copy of online application form. Only shortlisted applicants will be advised to provide signed printed copy of online application form along with requisite documents.